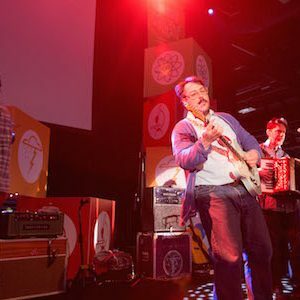 “They Might Be Giants” performed on the Einstein Stage. I have two degrees that end in the word, “science,” from a university that employed on its faculty a physics professor who received two Nobel Prizes and counted among the hundreds of thousands of its students one who gave the world Internet Explorer. But truth be told, I received those two degrees by avoiding taking one “real science” course versus the two that were needed to have “arts” after the degree. With that as history and knowing to this day, I do not understand geometry — in any form, I headed to the Walter E. Washington Convention Center off Mt. Vernon Square on a gorgeous mid-April Saturday. While hordes were flocking to the Tidal Basin to see the last of the cherry blossoms or walk among the other trees budding and ready to bloom, I was among the thousands indoors tramping around the upper level exhibit halls — for the 2016 STEM Fest. With this trip, it has become an enjoyable bi-annual family affair — even for someone like me. I am more than familiar with the convention center from my years with AUSA’s Annual Meeting and attendance at the fall book festival since it has been told to keep-off-the-grass on the National Mall. Instead of tanks and uniforms or authors talking about their latest work, there were tables everywhere with facts about molecules, soil, space, etc., and people eager to share what they know. I glommed onto the NASA area, though I didn’t take a seat in the toss-about module simulator. And then there were stages. On the Einstein Stage, yep named for the physicist not the bagel company, I laughed through Hank Green’s fast-paced “Why am I here” Crash Course spiel and “They Might Be Giants” rocking take on science, engineering and mathematics [technology probably came in their second set]. Oh I expected to see hundreds of kids with various fluorescent tees with the name of their youth or church group, school or club emblazoned in black so they could be easily identified when they stayed too long with NASA and it was past time to head back to the buses returning them to Annapolis, Petersburg, Winchester or even close-in Arlington. But what I was really surprised at seeing were so many adults in gray tees with letters such as CWRU [Case Western Reserve University in Cleveland], CMU [Carnegie-Mellon University in Pittsburgh] and even two big red “Rs” [Not for Rutgers but Rose-Hulman Institute of Technology in Terre-Haute, whose lineage races back to the Brickyard in Indianapolis]. And oh yeah, I should mention as a last fashion note because it cuts across the parent-child and gender divide. “Minecraft” shirts — long-sleeve, short sleeve. Thank heaven the next day’s NYT Magazine filled me in on that old-timey Swedish computer game.